I got to the airport 2.5 hours before my flight this morning only to discover I don’t clear customs until I reach Sydney. I think the lady at the check in thought I was a bit simple as she kindly explained that I’ll need to get the shuttle to the international terminal in Sydney then check in again with Air Canada. I think I looked puzzled. Both my check in luggage and carry on are over the weight limit but she ignored the additional kgs on weigh in and hopefully I’ll sneak through with the carry on. 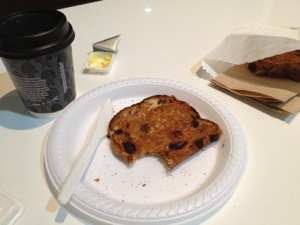 As you can tell I’m killing time taking photos of my breakfast and my view of the aeroplanes. I always get a weird feeling at airports. It’s like you step out of reality for some time and sit in this kind of limbo land until you reach your next destination. It’s a kind of no man’s land where you know nothing significant is going to happen until you get off the plane. Or is that just me? 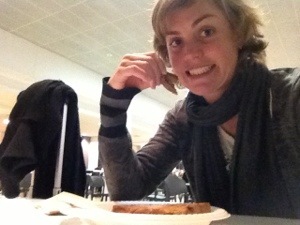 I’m in my own airport bubble eating raisin toast. 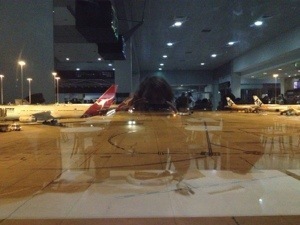 The earlier I get to the airport, the more likely I am to be rushing last minute to get to the flight. Still 1.5 hours to kill. Surely I can fit in another coffee and a quick nap perhaps? I’ve been told I’m obsessive compulsive when it comes to packing, which is why on a Friday afternoon I’m zipping up my suitcase for a Monday morning flight. My OCD did not alert me to the fact I can only check in one 23kg bag on the flight until just recently, which of course threw my idea of what I was taking into slight disarray. 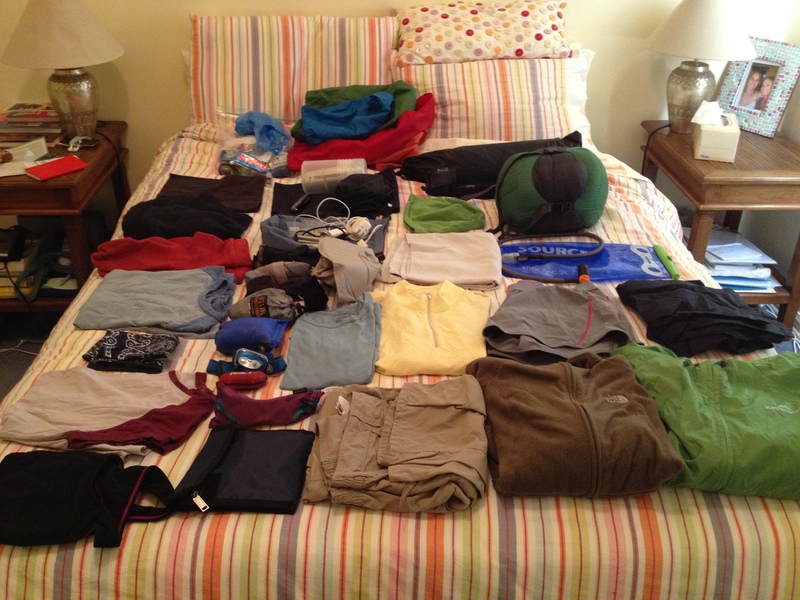 The contents of my pack so far… still missing a significant amount! I’ve decided to put my pack and all of the contents pictured above in a suitcase to keep it protected and to hopefully squeeze more items inside. 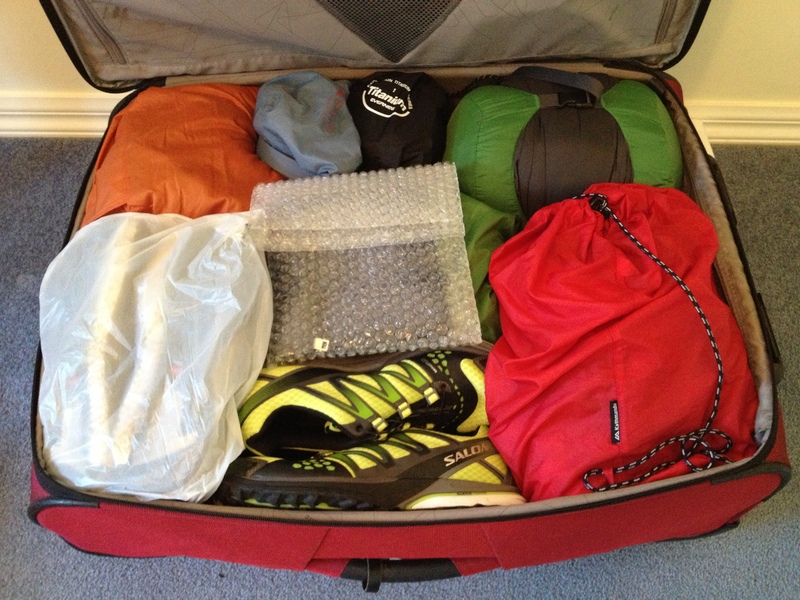 I’ll then take a smaller bag as carry on with all of my non-hiking clothes – the ones I won’t set fire to at the end of the trip. 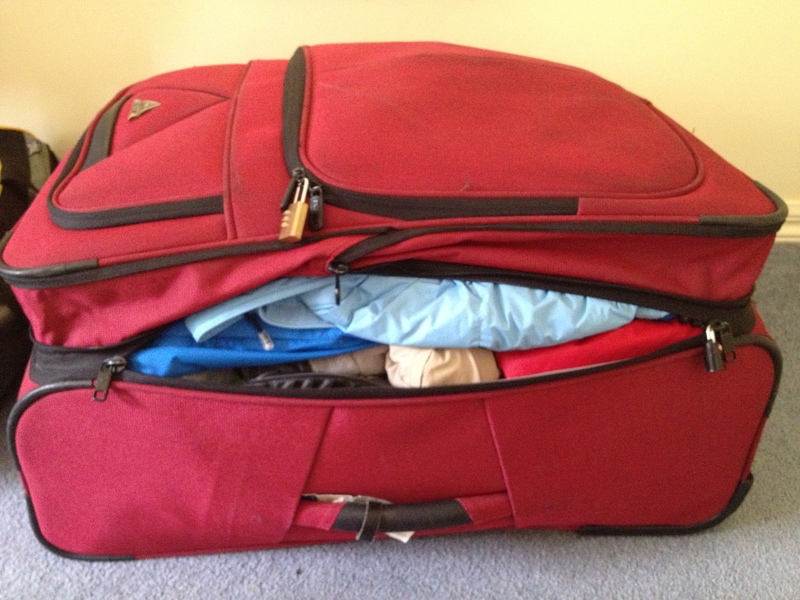 Suitcase with everything else shoved on top! I expect to be in pretty good shape by the end of today and will start going over my TO DO list again tomorrow. Being Easter weekend most people are off for a few days so I’ll have some time to get into the groove of being on my own for five months. Am strongly considering putting my e-reader back on the list of things to take! 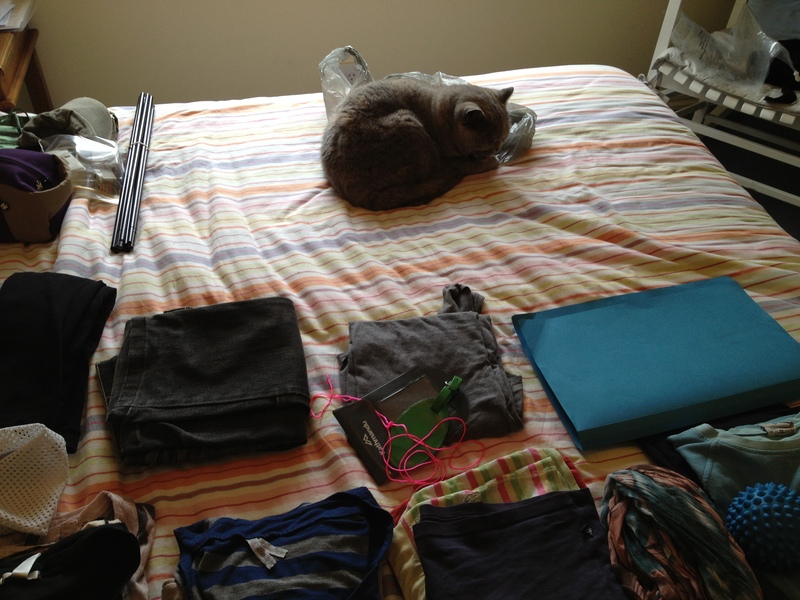 At least the cat’s around to help me pack! 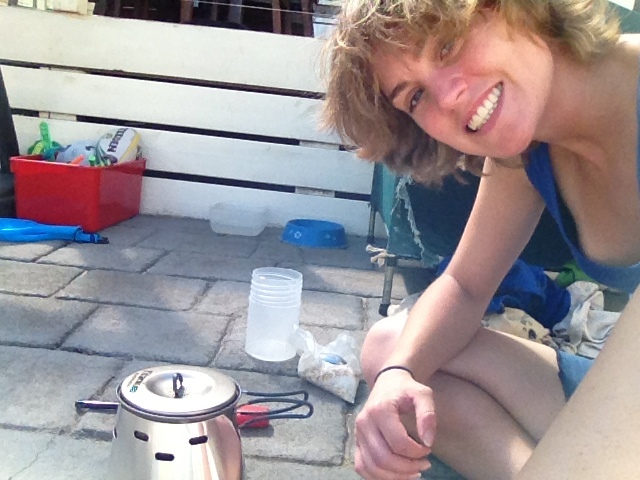 I finally cooked a real outdoor hiking meal today in the backyard using my stove. The wind was pretty fierce, blowing my measuring cup and plastic bag across the garden. Good training. 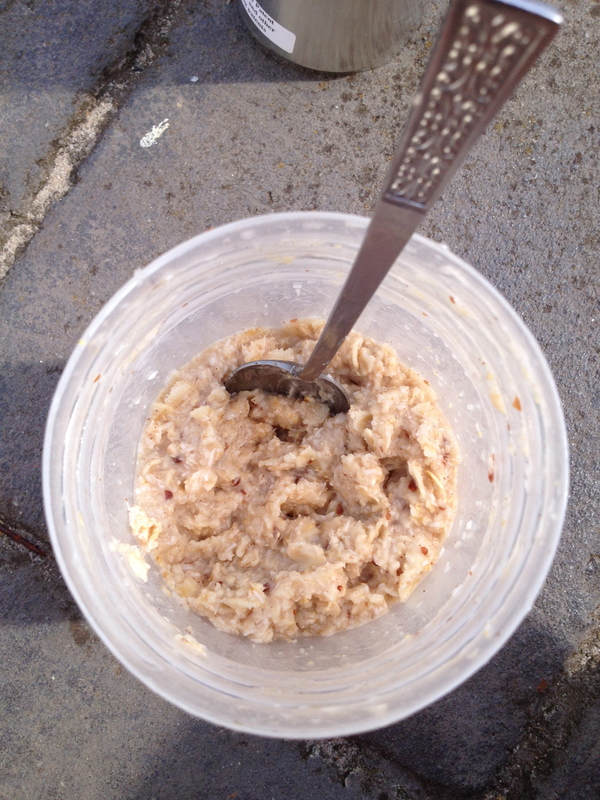 I used a recipe I thought of walking to the train station yesterday, nothing fancy, just oats, coconut, cinnamon and LSA. 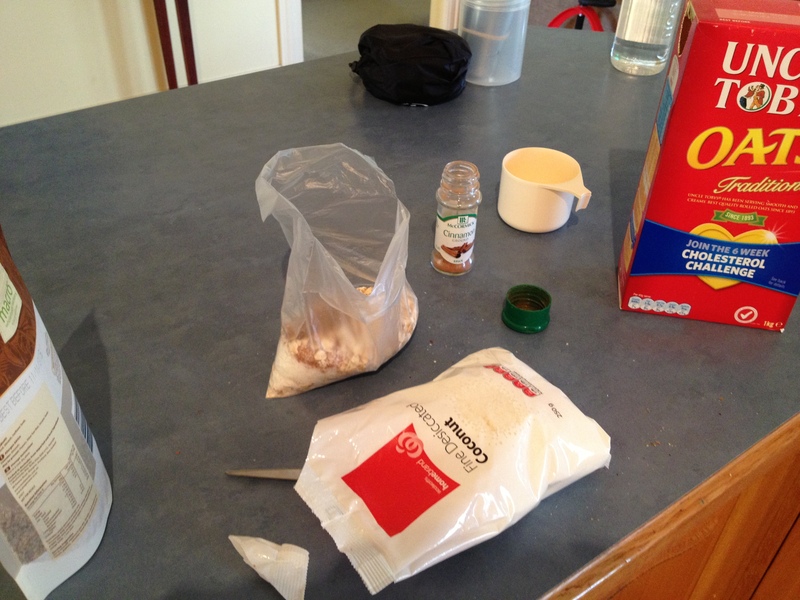 I would also add powdered soy milk and some kind of sweetener (coconut sugar?) for the real gig. 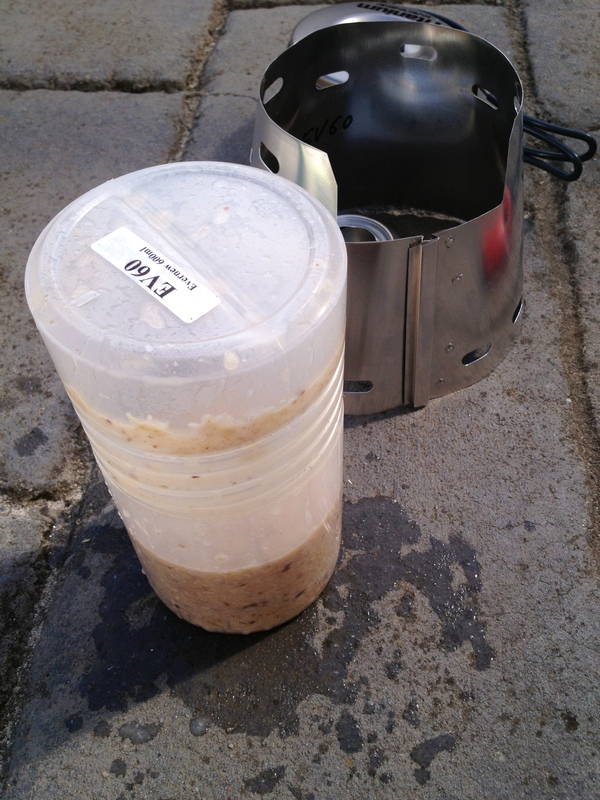 I mixed up one cup of oats, 1/4 cup coconut, a healthy sprinkle of cinnamon and some LSA. Then I took all the elements into the garden for the test run. I’ve nailed lighting the stove at least. Waiting for the 1 1/2 cups water to boil. I’m still trying to get through it all. One cup is WAAAAY too much and considering I’ll have to carry out any uneaten leftovers I’ll be going with 1/2 cup moving forward. The other very helpful lesson I learned was when I sealed my container to shake up the water and contents, boiling water and oat juice came seeping out the sides spraying all over me. Won’t be repeating that. My leaky container after a good shake. Conclusions? Very easy to prepare and package but I feel pretty disgusting after eating it. Sugar or sweetener needed and keep up the variety, I can see this getting old very quickly. It’s been quiet on the blog front this week as my To Do list slowly depletes and I become more and more anxious to get out there and put this planning into action. I’ve been churning through the mundane doctor, dentist checkups and focussing on strengthening and resting my back. This weekend was the first since January that I didn’t get out and hike, partly to rest my back and to focus on the important people I’ll be leaving behind. I’m currently enjoying the last point on the list while reminding myself to eat GOOD fats, so I’m not sure the burgers, chips and ice creams I’m consuming apply. 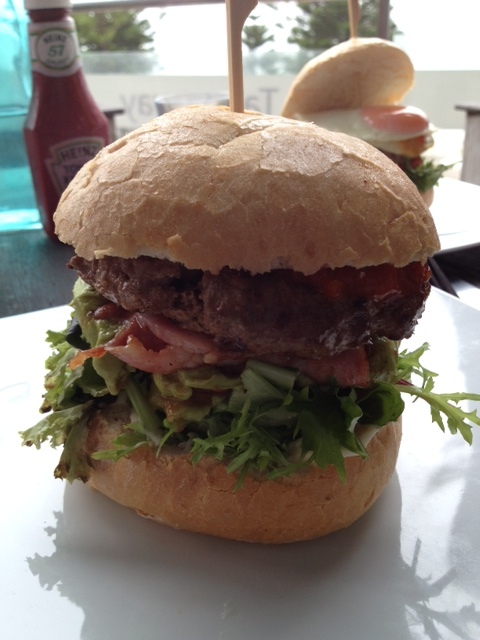 All part of the training regime. I am getting nervous, but more so impatient. I need to get out there now, unemployment and too much time to focus on the trip is driving me a little stir crazy. 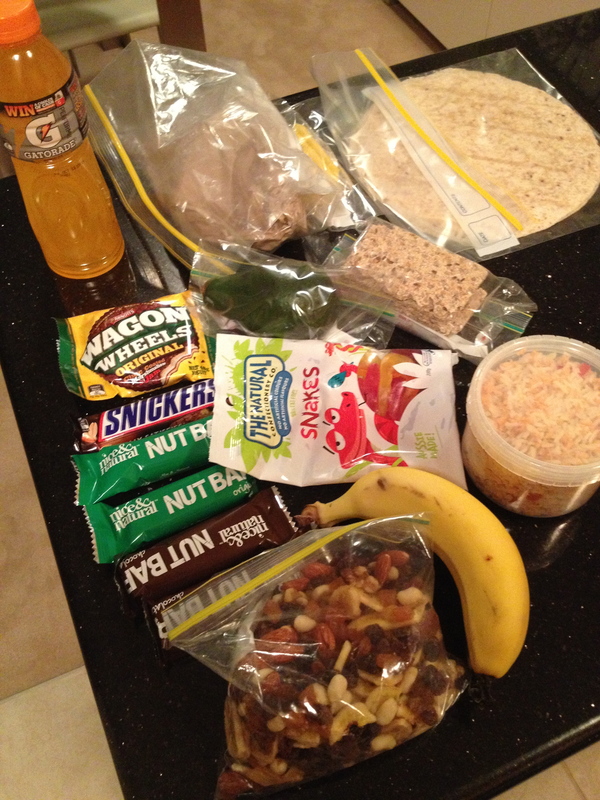 The pressure will be on in Vancouver to get my food purchased, dehydrated, sorted, packaged and boxed along with my maps and trail notes in the 10 days I’m there. This truly is the quiet before the storm. 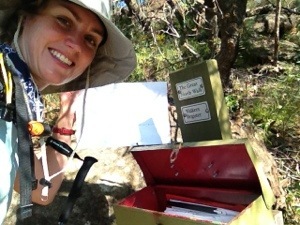 With exactly one month to go until I step foot on the PCT and only two weeks until I depart Australia, things are starting to fall into place. Today I received two essential items for the trip, my permit to hike and camp along the PCT and, my thought to be missing Caldera Cone stove. 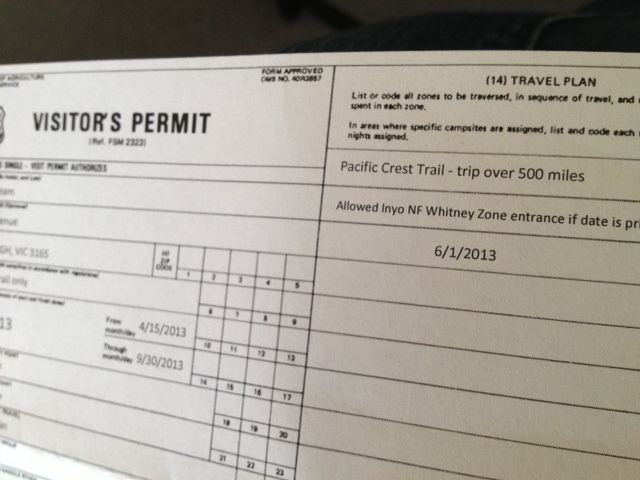 The fourth in a line of permissions and permits (Entry into Canada via the PCT, California Campfire Permit & US tourist visa) the PCT Long Distance Permit allows me overnight access anywhere along the trail and permission to travel on alternative trailheads to reach resupply towns. 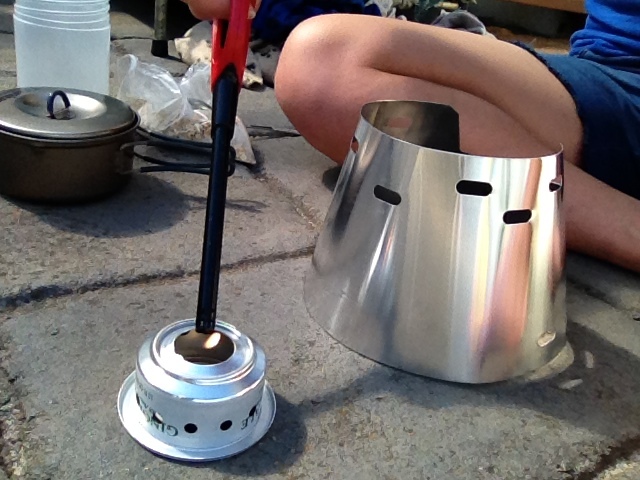 Trail Designs Caldera Cone stove set. The stove has arrived just in time to start practising some basic cooking in conjunction with developing some kind of meal plan. 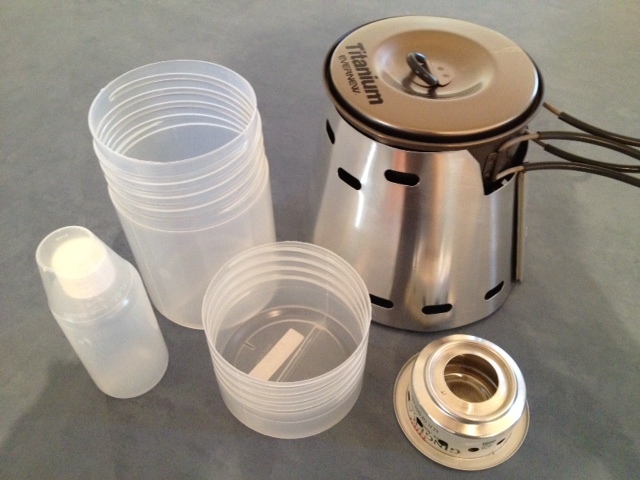 It’s extremely light weight, due to the fact the pot is small enough to fit in a dolls house and the rest of the pieces fit inside a plastic caddy which doubles as a cup and bowl. I had read on many blogs that you can make your own similar stove at home using an aluminium baking pan as a windshield and a soda can to burn fuel in. 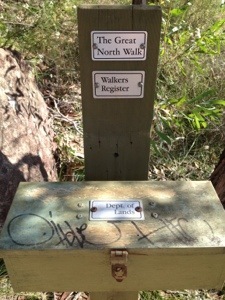 I didn’t expect Trail Designs would ACTUALLY make the burner system out of soda can! 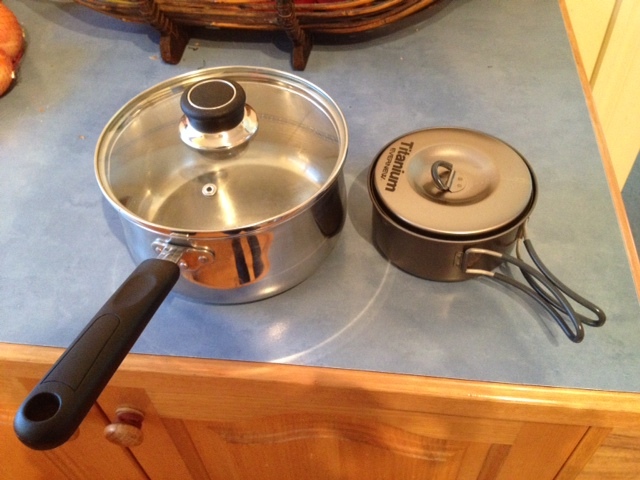 My weeny non stick cooking pot (pictured right). 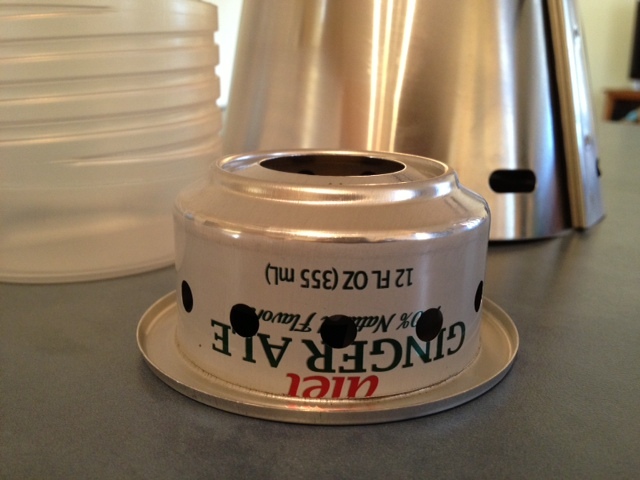 Trail Design’s alcohol stove made from a Diet Ginger Ale can. With my feet up on the coffee table it’s hard to believe the anguish I was going through earlier today climbing up and down the gorges inside Berowra Valley Regional Park. 14km felt more like 40km with the amount of climbing involved in this section of the hike. 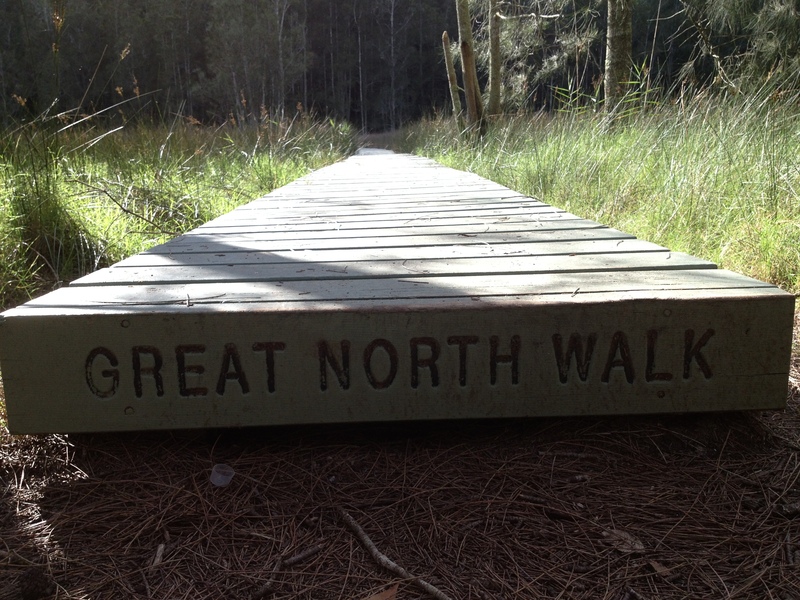 The Great North Walk goes all the way from Sydney to Newcastle (approx 300km). 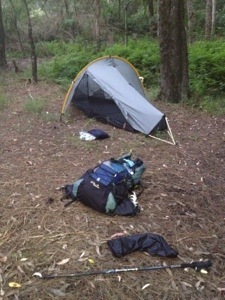 I woke at 6am to kookaburras and buzzing mosquitos and after completing my back stretching ritual, started packing my backpack before taking down the tent. The Crosslands campsite was actually only 10 minutes down the path but there was another school group camping there so I was thankful I had my own quiet spot. At Crosslands I met a Chinese man and his elderly father who were also planning to hike to Cowan. They were enquiring as to where the trail started so we walked to the beginning of the track together and I left ahead of them, hoping they wouldn’t catch up too quickly given the father had to be in his 70’s. 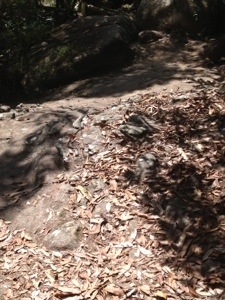 The climbing was TOUGH! There were many parts where I had to fold away my hiking poles to hold onto the rocks and haul myself and the extra 1/4 of my weight up. 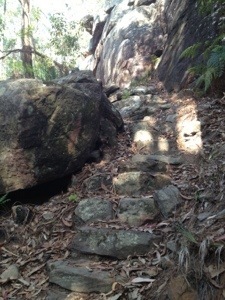 There was one particular climb which just never seemed to end. I was muttering obscenities under my breath and would have yelled so the whole valley could have heard me if my two friends weren’t close behind me. 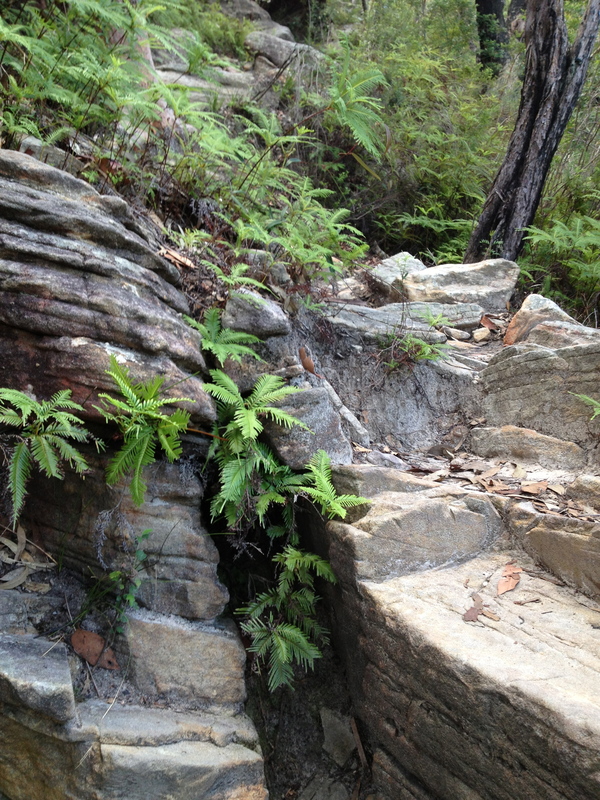 Ground level looking over Berowra Waters. 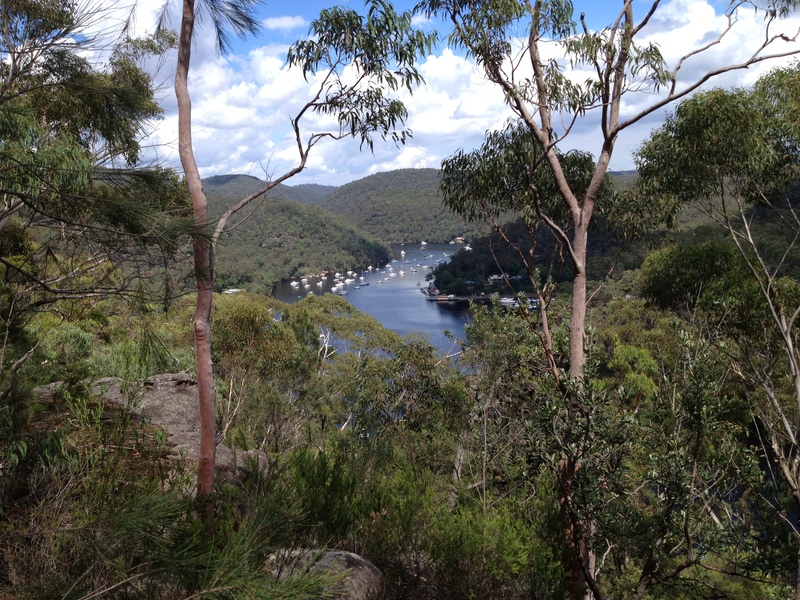 The view over Berowra Waters after another hideous climb up! 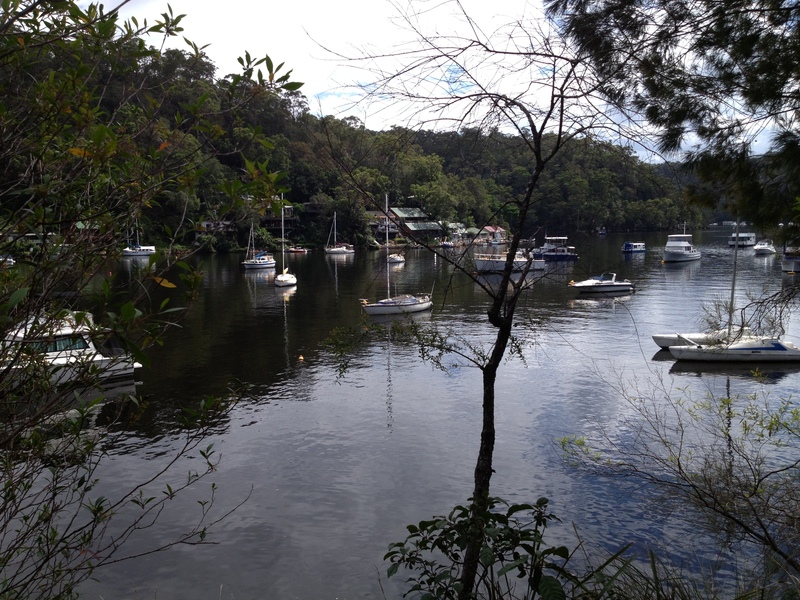 I took a quick snack and toilet break at the base of Berowra Waters and was surprised when my two Chinese friends were sitting there happily eating their lunch. The younger man only spoke basic English but after expressing to them what a tough climb it had been he just laughed and nodded. His father hadn’t even worked up a sweat! They insisted I take the rest of their food because I obviously looked like I needed it. On one hand the juicy apples looked delicious, on the other hand the thought of carrying any extra weight was too much! I compromised and took only one giant apple, and some kind of preserved beef snack. 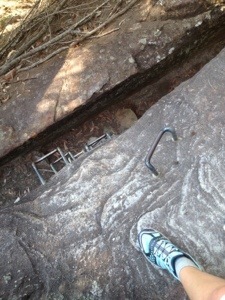 Some of the tricky rock climbs. 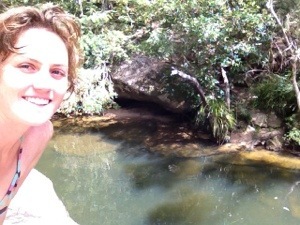 Despite my whining this was a truly stunning walk. 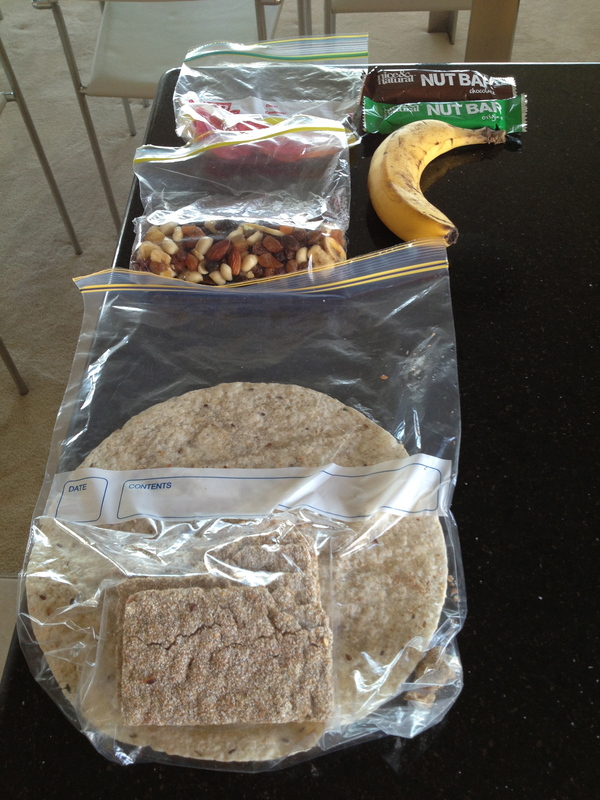 What it did teach me was that every ounce of weight DOES make a difference, and that I’ll need to be meticulous when packing, especially if I’m expecting to carry seven days of food as opposed to just two! Two days worth of food. I crawled into camp tonight like a wobbly four legged spider, walking poles flailing in front and my legs dragging behind. Today was the most challenging 20km walk I’ve ever done, add a 14kg pack and 9 hours of walking and you can understand why I fell short of my actual target. I’ve stopped about 30 mins from the Crosslands Reserve campsite, in a little clearing with no facilities just beyond a group of young women on a canoe expedition. There are a few freaky noises outside the tent including growling, scratching, the odd branch snap and a whole host of activity going on in the reservoir I’m next to. 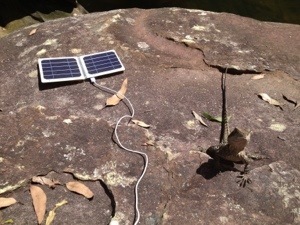 Today was full of adventure, lunch with a group of lizards after a quick dip in the lagoon, an encounter with a tree snake, walked through a rifle range amid the sounds of gun shots, getting lost a couple of times and setting up the tent while fending off swarms of mosquitos! I snacked all day and now don’t feel like eating dinner plus I haven’t peed since lunch which means the 3L of water I drank wasn’t enough. Luckily when I finally reach the Crosslands campsite tomorrow I can fill up my water bladder. The ground is pretty soft so I haven’t bothered blowing up my sleeping mat. I’m just lying on it with my sleeping bag on top. It’s so hot I doubt I’ll need my -10 degree bag! I may venture out to pee before bed and will hopefully avoid the anaconda in the river and the growling gremlin outside!